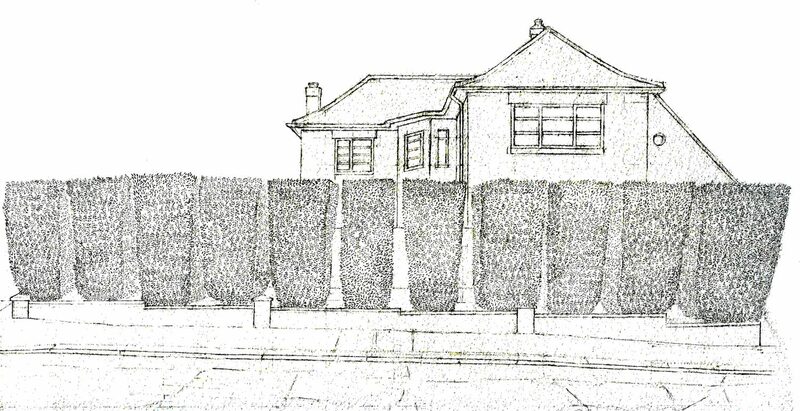 Toward Pinner Green and the Uxbridge Road on Elm Park Road is this……….hedge. The suburbs and hedges are inseparable. Here is an example, on Cuckoo Hill, between Pinner Green and Pinner. This building is located on Elm Park Road, Pinner. The simplicity, the stippled wall, the dark forecourt. The Oddfellows Arms in Pinner. A drawing installed in the Public House. This is the drypoint print from my drawing of the Loudon Memorial in the Pinner Parish Churchyard. This memorial was erected in 1809 by John Loudon , a horticultural writer. It is a tall mass of masonry, shaped like an inverted ‘V’ with an arch pierced at the base, filled with ornamental ironwork.